Beverly Chills & Vomit | It's not my fault. If you dont already have Children and you think you want them, let me change your mind. 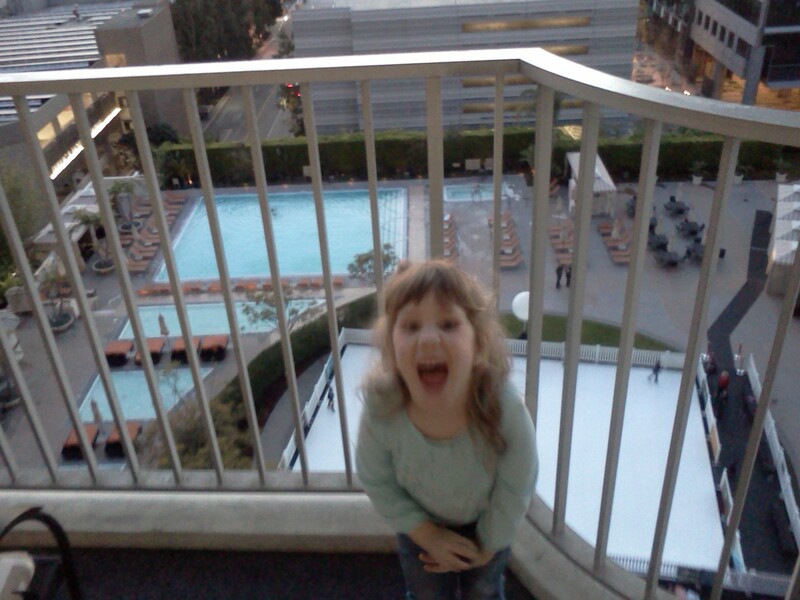 Two days at a hotel in Beverly Hills for Christmas. Currently, I work for a major hotel chain and am entitled to a few comped rooms a year. Plus, since my divorce, it’s just the three of us. Usually, I work holidays. This is my only holiday off this year. I wanted to make the most of it. Christmas eve, I finished my shift at work before heading back home to pack. I loaded up all my kids presents from santa into giant, black bags and loaded them in my trunk. It was 4pm, Tallulah fell asleep in the car. I tried my best to wake her up, because as any mother of a three year old knows, late nap equals late bed time. I highly value my sleep. Too late. Tallulah fell deep into her car seat snooze fest. My attempts were in vain. We had just pulled off the freeway when it started. “Mom, I have to throw up.” PJ told me. “We are almost there. Can you wait?” I begged him. “Can I throw up on that grass?” PJ points out the window. I turned my head around. PJ was as white as a sheet. I rolled down the window not a second too soon. PJ covered the side of my car just as we were a block from the hotel. A minute later I pulled into valet. As I was getting help with my luggage, one of the wrapped toys went off. “I am a beautiful princess!” Came muffled out of one of the bags. The Bell Hop asked my kids. “Shhhh!” I warned him. “No! Santa doesn’t come until tonight.” I said loud enough for my kids to hear. I grabbed their hands. We walked into the hotel lobby and to the front desk. We were given a free upgrade on the 11th floor! “Mommy, I have to throw up again.” PJ told me. I pointed him to the restroom. After PJ dispels the left overs of his guts we walk towards the elevator. The people in front of us get on. My kids are boarding when the man, inside, pushes a button to close the door. It hit my sick, five year old son on his way in. “Ouch!” He yells as he grabs his shoulder. I gave the man a dirty look. First we stopped on the 9th floor. Tallulah was ready to get off. “Not yet.” I tell her. She got off anyway, running. I stepped off the elevator to catch her when the door closed. Up went PJ in the elevator. How do these things happen??? I stood there for a moment, with Tallulah’s hand in mine, debating my options when the elevator chimed. It stopped on the 10th floor. Tallulah tried to bolt out the door again. I grabbed onto her coat and scolded her. “Did you learn nothing a moment ago? You want me to hurt you, dont you?” I asked her. A woman in the elevator put her hand over her mouth in shock. “We are almost to our room.” I told him. Pj puked in the toilet. The kids discovered the balcony patio. I let them go outside. Below our room are the pools and ice skating rink. Tallulah liked this very much. Then, the kids started fighting. I was scared one would fall off, so, I brought them back inside. It was time for dinner. I didn’t think Pj would make it through a restaurant, wanting to keep him near a toilet, we ordered room service. “What do you guys want to eat?” I asked them. “Peanut butter and jelly!” Tallulah screamed. “Let me check the menu. Yup. They have those.” I said. I ordered the meals. For myself I decided to splurge on lobster ravioli. A little while later the food came. “Should I set this table up by the bed?” The man from room service asked me. “No, right there is fine.” I responded. I handed Pj a piece of pizza. He took a bite. All the meat and cheese landed on the bed leaving a tomato sauce stain. “No! I dont want this! I want that!” Tallulah says, pointing to my plate. Tallulah had changed her mind. She decided she wanted ravioli for dinner instead. She dumped it on her bed. Pj puked again. He didn’t make it to the toilet. I cleaned it up the best I could, ate my peanut butter and jelly, then started the bath. The kids were excited. The tub was huge. “Don’t splash!” I told them. Then I walked into the other room to make some tea. I ran back into the bathroom. The floor was under an inch of water. The mirror, water spotted. I cleaned it up, washed the kids and got them into their pajamas. It was close to 8pm. Time for TV and bed. Thats weird! I hadn’t ordered anything else. 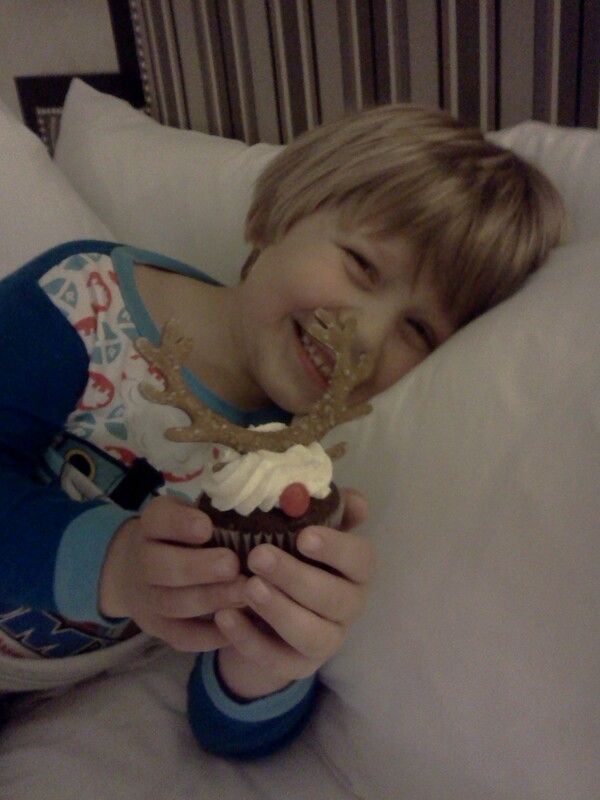 They were delivering Christmas cup cakes, decorated like reindeer. Then he threw that up too. The kids didn’t fall asleep until after eleven. I put the presents out and fell asleep myself. It was 4am when it happened. “Mommy! Mommy! I pee’d! Ahhhhh! I pee’d!” Tallulah screamed. I jumped up. I was laying in a puddle. I didn’t have any extra pajamas. I hand washed my shirt, changed Tallulah and put a towel over my half of the bed. Do I sleep on peepee OR do I switch beds and attempt to avoid vomit. The vomit had to be dry by now. Tallulah fell right back to sleep next to her puddle. “Mommy, where is Santa at right now?” Pj asked me. “No, go to sleep!” I ordered. 5am, the bed starts shaking. 6am, “I have to pee.” Pj says. The kids started opening presents. He opened the next one. He threw them on the floor in	anger. “See! I told you if you didn’t go back to sleep Santa would take your toys away!” I said, laughing. It’s only noon. I still have the rest of the day to go. If you are a Christian, pray for me. You didn’t think I’d actually have a normal post, did you?